A pedigree chart is essential to understanding how one individual is related to her ancestors. You can use a chart to map out several generations of your ancestors, or you can create a chart for any individual in your tree. Printable pedigrees allow you to customize and print the chart for your files and share your work with other members of your family. A bow-tie-style pedigree chart is a great way to see your ancestors on both sides. This printable version covers four generations and even includes space to upload a photo of each individual, allowing you to create a beautiful visual representation of your ancestors. Before you begin, take some time to gather as much information as you can about your ancestors. This should include the family relationships, as well as the names, birth dates, marriage dates and death dates for each individual. Take a moment to go through your family photos to get an image for each person in the pedigree. Scan the photos so you can upload them. Click on the image of the bow-tie chart and download the PDF file to your computer. Input the data about each person, as well as the photos you scanned. Save the file and print it. Note: If you need help printing the charts in this article, consult the Guide to Adobe Printables. Click to print this free pedigree chart! This five-generation printable pedigree is a great place to record your ancestry if you want to incorporate more generations into your chart. You can also add photos of images to represent each person in your family tree. Gather as much information as you can about five generations of your family (including you). You'll need the full name, date of birth, date of marriage and date of death for each person. Scan a photo to represent each person in your pedigree. Since it's not always easy to find photos five generations back, consider using another image to represent these individuals. A photo of a headstone, the farm where the person lived, or a symbol of the person's occupation are all great ideas. Click on the image of the pedigree chart, and your computer will prompt you through the process of downloading the PDF file. Once the file has downloaded, open it and begin entering information. 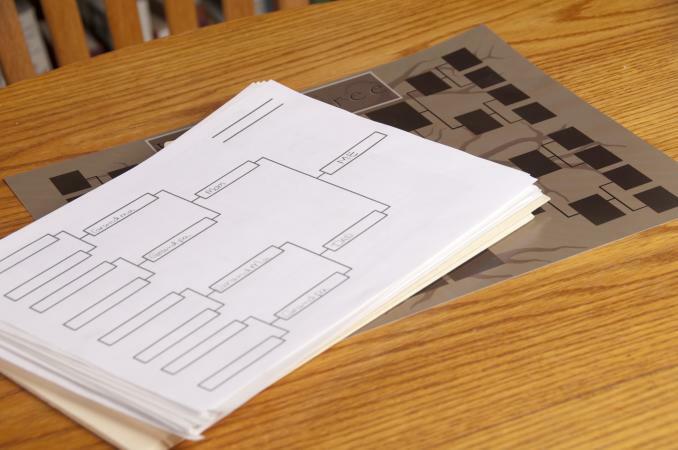 Save your work, and then print the pedigree for your genealogy records. 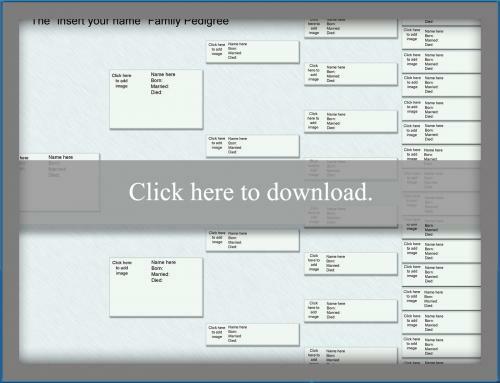 Pedigree charts are at the heart of genealogy. As the study of the generations, genealogy relies heavily on documenting individuals' pedigrees. For example, the family tree of Confucius is based on one of the oldest pedigree charts in history, dating back to 1080 AD when it was printed by hand. Organize individuals at a glance. As you do your research online, it's hard to remember how everyone is related. Printing a pedigree chart for each of your grandparents can serve as a hard copy for reference and can help you keep track of the generations. Figure out where to target your research. Genealogy is about working backward until you hit a "brick wall." However, you don't know what you don't know until you lay everything out. A pedigree chart can show you where you need to concentrate on finding information, which makes you a more efficient researcher. Communicate your research with others. For people who aren't totally familiar with the names and generations, talking about family history can become tedious pretty quickly. It's just hard to keep all the generations straight. Fortunately, if you have a printed pedigree chart handy, you may find that other family members have an easier time following and enjoying your research. Back up your work. Many people spend years working on their genealogy, but this work is at risk of loss if you have a computer failure. Having a hard copy in the form of printed charts is a good way to safeguard your research. Pedigree fan chart - This handy chart gives a double pedigree for a couple, going back four generations. Family tree diagram - This chart has lines for recording basic information about an individual and three generations of his ancestors. Family tree templates for kids - These simplified pedigree charts are in the style of family trees and are easy for kids to use and enjoy. There are several designs to choose from, depending on the child's age. 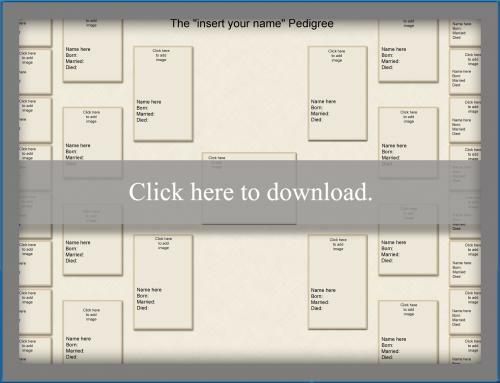 Printable pedigree charts are an excellent way to record and share your research. Create a pedigree for each member of your family and for multiple generations in your tree. Then you can print hard copies of your work and have a backup of your research in case anything happens to your computer files.